StockWizard™ allows you to define several users with different level of access. This way you can have some people who can create your list of stocks and see all the reports for reordering and other users who can only take parts from stock and return them back to stock. 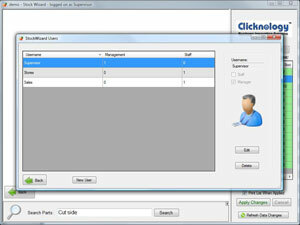 Each user can have their own picture and can be logged in with a single click of a mouse. Administrators can click on their icon and then simply enter their password. Alternatively, some (or all) users can be prevented from displaying as an icon on login screen and they can login by entering their username and passowrd in the appropriate fields. 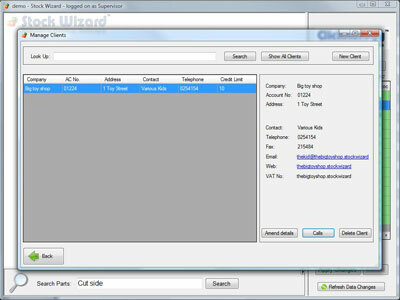 The main menu screen takes you to all the features of StockWizard™. Accordng to the rights of the user who is logged in, they might and might not see the Reports and Setup button. The quickest way to find if the part is in stock or not is to search for it. 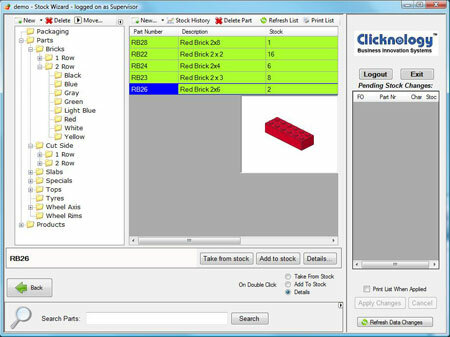 You can enter a part of part number, description, barcode or serial number. The results will come in a color coded grid which clearly shows which parts are in stock, which are running low and which are out of stock. You can also see how many are on order. If the user is logged in, the transaction bar on the right will be visible to them most of the time. It behaves a little bit like a shopping cart where they can place all the parts they need and add, remove, or amend any line at any time. Once they are happy with their selection, it is a matter of one click on the Apply changes button and, providing they have ticked the "Print list when applied" tickbox, a list of items will be printed. Each of the lines will show in which location in your stores can they find the part and how many should be in stock, which provides also a simple inventory check as you go. The logo displayed on the main screen can be customized to your own one - there's never enough places where to promote your trademark. The unique storage system of StockWizard™ allows you to create categories as a tree structure for easy navigation. Each part can be placed in multiple categories (as a reference) which means that if you are, for instance, reusing one part in different products and want to change the location where you keep it in your stores, you make a change on one place only and all the other references change automatically. This is such a flexible system that a majority of businesses finds StockWizard™ easy and suitable to use for their applications. To save space you can hide the categories tree if you need more space for the grid and if you are an administrator you can also hide the transaction bar. This gives you more space for the grid and makes your life easier. When entering the parts to the system and you by mistake create it in a wrong category, just drag it to the right one. If you have parts which are very similar, you can create a copy of an existing one and change just the information which is different. The clearly readable color coded grid shows you straight away what are the stock levels and you. 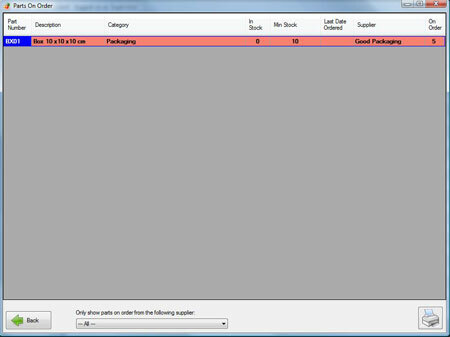 Click "Add to stock" or "Take from stock" and a dialog will ask how many pieces would you like to move. When confirmed, a new line is created in your transaction bar. Administrators don't even need to add it to the transaction bar - they can apply the change straight away. For users who don't have that much experience with computers, we have added a special gray cover for the back windows. This maintains their focus on the dialog which comes up rather than anything behind it. This greatly reduses confusion and increases productivity. When you click on the "Details" button you can see all the information there is on the part including last transactions made with that part. If you are an administrator you can change all the details otherwise you can only view them. An image can be attached to each part to further assist with recognising parts. The displayed image is scaled down to fit the image frame. But should you need to attach a complicated drawing, a simple click on the image will bring up a full scale version. 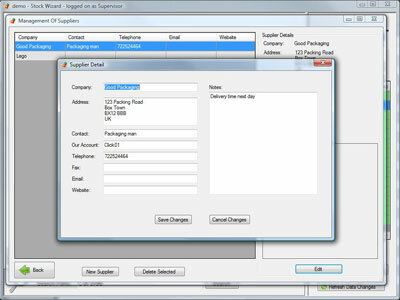 Entering a supplier information for the part will make your life easier when reordering. The value is used to get a total value of your stock. 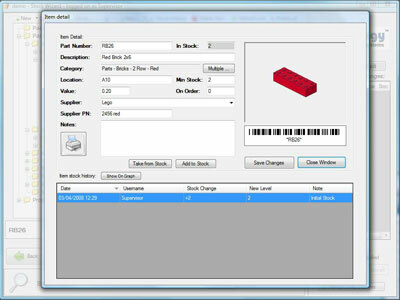 The barcodes can be printed with the integrated help of Avery Wizard (needs to be downloaded and installed) or you can save the image of the barcode and print it using any program of your choice. 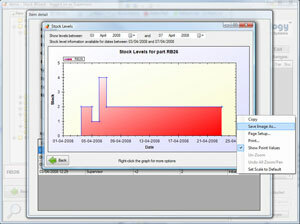 What better way to determine what minimum stock levels to set than to see the stock levels on a graph? Anybody what were the stock levels of the part in time on a graph. 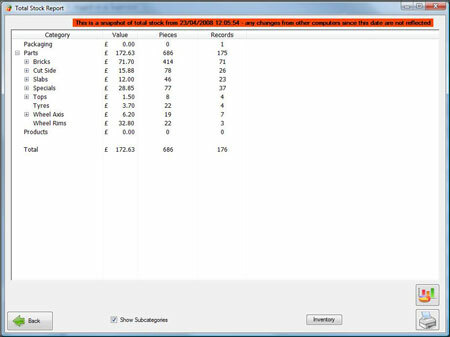 StockWizard™ includes a set of reports to make your life easier when reordering, checking current levels and values. These reports are only available to administator users. Crucial for any business is to know which parts are out of stock or need reordering. Each part holds an information about Minimum stock and once the current level gets below the minimum stock level the part appears on the Low stock report. You should check this report regularly although, to make this task easier, the number of items not on order and below minimum level is shown on the main menu screen when the administrator logs in. It is from this report where you set that you have ordered a part and how many pieces. You can filter just the parts which are not on order and as on any other grids, you can sort it by any column by clicking the header. To print the list, just click the printer button. This is the reverse report to the low stock report. Some of our customers are manufacturing some of the parts themselves. They would then filter the list to show parts on order from them as a manufacturer and print the list to process it further. Have you ever wondered how much money have you got in your stock? To find out exactly is a matter of a few clicks with StockWizard™! When it comes to checking your inventory, you can click the inventory button and a full list of all items in the system will pop up. This list can be printed to make any notes while counting. 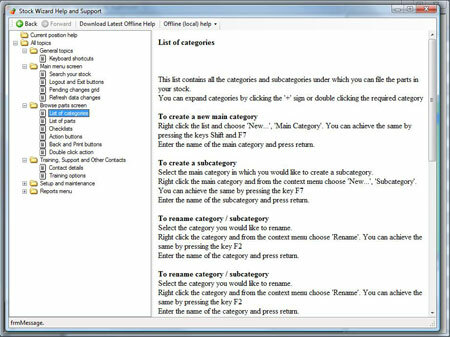 You can enter all the information needed for easy reordering of parts - each part has a field for a supplier. With StockWizard™ help is always at your hand. You can download an updated copy of the help to your computer and view it offline or just select the online option and you will be seeing the latest up-to-date version of help available on our website from the program screens. As we improve our software all the time, there is a built in update function. Your copy of StockWizard™ can check for new updates automatically at the start, or you can trigger this check manually from the setup menu. 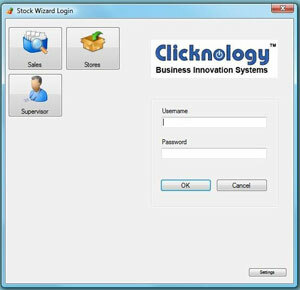 To use this feature you will need your main StockWizard™ computer (server) to be able to access the internet. All the other computers connection to the server will automatically update to the new server version when available and those do not need access to the internet. Click here to give it a try now - it's free anyway!